Internet traffic is growing exponentially, with no end in sight. Data centers and telecommunications networks need to scale and adapt almost continuously to manage increasing application workloads, new security demands, and escalating user expectations. Yet budgets remain tight, requiring that operators evolve their infrastructures in the most cost-effective way possible. 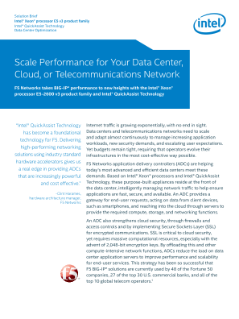 F5 Networks ...application delivery controllers (ADCs) are helping today's most advanced and efficient data centers meet these demands. Based on Intel® Xeon® processors and Intel® QuickAssist Technology, these purpose-built appliances reside at the front of the data center, intelligently managing network traffic to help ensure applications are fast, secure, and available. An ADC provides a gateway for end-user requests, acting on data from client devices, such as smartphones, and reaching into the cloud through servers to provide the required compute, storage, and networking functions.